Emperor Meiji (明治天皇, Meiji Tennō, literally “emperor of enlightened rule”) (November 3, 1852 – July 30, 1912) was the 122nd imperial ruler of Japan, according to the traditional order of succession. His personal name was Mutsuhito (睦仁). At the time of his birth in 1852, Japan was an isolated, pre-industrial, feudal country dominated by the Tokugawa Shogunate and the daimyo, who ruled over the country's more than 250 decentralized domains. During the reign of the Meiji emperor from 1867 to 1912, Japan was transformed from a feudal country into one of the powers of the modern world. 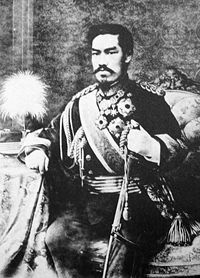 Emperor Meiji rarely wielded personal political power, but he presided over the Westernization of Japan by abolishing the feudal land system, reforming education, and adopting for Japan a democratic form of government under the Meiji Constitution of 1890. The Meiji emperor himself embodied the imposition of Western innovations and ideas on traditional Japanese culture; he wore Western clothes and ate Western foods. However, he composed over 100,000 poems in the traditional Japanese style; through them one can learn the private thoughts and feelings of this very public man. Emperor Meiji was born on November 3, 1852, in Japan, the sole surviving son of Emperor Kōmei by the lady-in-waiting Nakayama Yoshiko (1834–1907), a daughter of Lord Nakayama Tadayasu, sometime minister of the left (sadaijin) and a scion of the Fujiwara clan. He was born eight months before the arrival of Commodore Matthew C. Perry and the United States squadron of "Black Ships" in Edo (modern Tokyo) Bay and two years before the first of the unequal treaties which the Tokugawa shogunate signed with Perry. Originally titled Sachi no miya (“Prince Sachi”), the future emperor spent most of his childhood at the Nakayama household in Kyoto, as it was customary to entrust the upbringing of imperial children to prominent court families. He was formally adopted by Asako Nyōgō (later Empress Dowager Eishō), the principal consort of Emperor Kōmei, on July 11, 1860. On the same day he also received the personal name Mutsuhito, the rank of shinnō (imperial prince, and thus a potential successor to the throne) and the title of Kōtaishi (crown prince). 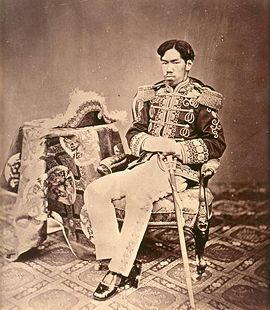 Crown Prince Mutsuhito acceded to the throne on February 3, 1867 at the age of 14. Later that year, the Japanese era name was changed to Meiji, or “enlightened rule,” which was later used for his posthumous name. This marked the beginning of the tradition of proclaiming one era for the entire reign of an emperor, and posthumously naming him after the era over which he ruled. The ascension of the Mutsuhito to the throne signified the return of power from the Tokugawa shogunate to the emperor. The Meiji Restoration marked the dissolution of Japanese feudalism and the forging of a new, modern state. Emperor Meiji personally held little political power, but he was a paramount symbol of the unity of Japan. In 1868 he launched the Westernization of Japan by taking the “Charter Oath of Five Principles.” Though he did not actually initiate the reforms, he officially ordered the abolition of the feudal land system in 1871; the creation of a new school system in 1872; the adoption of the cabinet system of government in 1885; the promulgation of the Meiji Constitution in 1889; and the opening of the diet in 1890. The constitution adopted in 1889 created a diet with an upper house selected primarily from the aristocracy, and an elected lower house, to advise the government. A cabinet of close advisors was directly responsible to the emperor but not to the Diet and was considered above politics. In practice, the emperor allowed a group of close advisors, known as the genro, or elder statesmen, to choose premiers. Under the direction of these advisors (including Ito Hirobumi, Yamagata Aritomo, and Inoue Kaoru) Japan became a modern industrial state and demonstrated its military power in the first Sino-Japanese War (1894-1895) and the Russo-Japanese War (1904-1905). "Know ye, Our subjects: Our Imperial Ancestors have founded Our Empire on a basis broad and everlasting and have deeply and firmly implanted virtue; Our subjects ever united in loyalty and filial piety have from generation to generation illustrated the beauty thereof. This is the glory of the fundamental character of Our Empire, and herein also lies the source of Our education. Ye, Our subjects, be filial to your parents, affectionate to your brothers and sisters; as husbands and wives be harmonious, as friends true; bear yourselves in modesty and moderation; extend your benevolence to all; pursue learning and cultivate arts, and thereby develop intellectual faculties and perfect moral powers; furthermore advance public good and promote common interests; always respect the Constitution and observe the laws; should emergency arise, offer yourselves courageously to the State; and thus guard and maintain the prosperity of Our Imperial Throne coeval with heaven and earth. On September 2, 1867, Emperor Meiji married Empress Masako (later Haruko) (May 28, 1849 – April 19, 1914), the third daughter of Lord Tadaka Ichijō, at one time the minister of the left (sadaijin). Known posthumously as Empress Shoken, she was the first imperial consort to receive the title of kōgō (literally, “the emperor's wife,” translated as “empress consort”) in several hundred years. She devoted herself to promoting national welfare and women’s education, and was respectfully known as the “Mother of the Nation.” She also helped to establish the Japanese Red Cross, and being especially interested in the activities of the Red Cross during peace time, she donated a fund to the International Red Cross, “The Empress Shoken Fund.” It is currently utilized for international welfare activities. Although Shoken was the first Japanese empress consort to play a public role, she bore no children. However, Emperor Meiji had fifteen children by five official ladies-in-waiting. Only five of his children, a prince born to Lady Naruko (1855–1943), the daughter of Yanagiwara Mitsunaru, and four princesses born to Lady Sachiko (1867–1947), the eldest daughter of Count Sono Motosachi, lived to adulthood. Emperor Meiji was the first Japanese monarch to remain on the throne past the age of 50 since the abdication of Emperor Ōgimachi in 1586. Near the end of his life, several anarchists, including Kotoku Shusui, were executed on charges of having conspired to murder the sovereign. This conspiracy was known as the High Treason Incident. Emperor Meiji died July 30, 1912, and was buried in the Fushimi Momoyama Ryo (Graveyard) in Kyoto, his soul being enshrined in Meiji Jingu (Meiji Shrine). Emperor Meiji learned from his father and began writing waka poems at the age of eight. During his lifetime he composed approximately 100,000 poems and was known as “Sage of Poetry.” Waka, also called tanka, are very short poems containing 31 syllables. The writing of tanka poetry was traditionally called “Shikishima no Michi” (“The Way of Shikishima,” a poetic name for Japan) and has been practiced for over one thousand years. Historically, the writing of waka was promoted by the Imperial Court. Emperor Meiji wrote waka in the course of his daily life rather than as works of art to be appreciated by others, giving them a sincerity and heart-felt expression that touch the heart of the reader. Only about five hundred of Emperor Meiji’s waka have been made public. With root sunk deep in stone. Such a clear reviving soul! This page was last modified on 7 September 2017, at 15:43.